it’s something so many people want to achieve at least once in their life and yet such a difficult task. This article explains why this goal is so hard but also something you should not be afraid of. Because there’s a pretty simple way to predict whether you are able to finish a marathon and in which time. Recent studies prove it: A lot of people fail to finish a marathon or fulfill their expected finishing time. 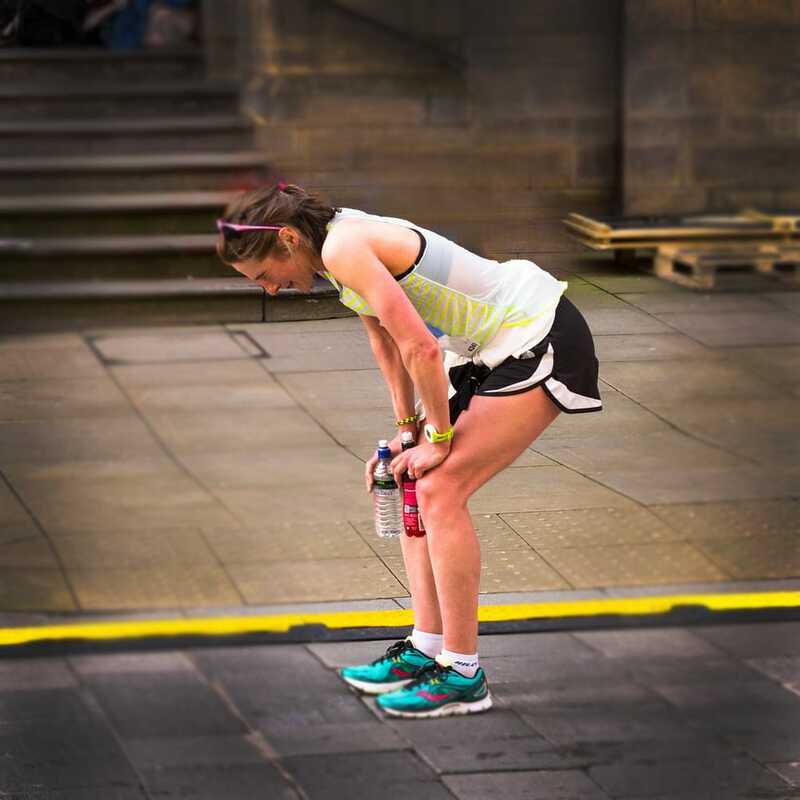 Around 40 percent experience the so-called phenomenon of “hitting the wall” which is a state of dramatic decrease in performance (running speed) due to almost total depletion of carbohydrate stores. But how many carbohydrates do you need to complete the race? And how to avoid exhausting your carbohydrate reserves, knowing that such depletion will result in a drastic and painful decrease in performance? In our recent blog article we explained the importance of carbohydrates for human energy production during long sport events like a marathon. Our muscles use carbohydrates and fat to produce energy during movement. Unlike fat reserves, carbohydrate stores are comparably small and the main limiting factor in terms of longer exercises. Depending on body weight (muscle mass) and training status, the human body stores around 400 – 800 grams of carbohydrates. The main part of is stored in form of glycogen in the skeletal muscle (±300 – 700 g) and the rest in the liver (±80 – 120 g). Now we have an idea of how many carbohydrates we can store. To answer the question which marathon finishing time will be realistic, we have to find out how many carbohydrates we use when we are running. can be measured directly via our metabolic performance diagnostics. 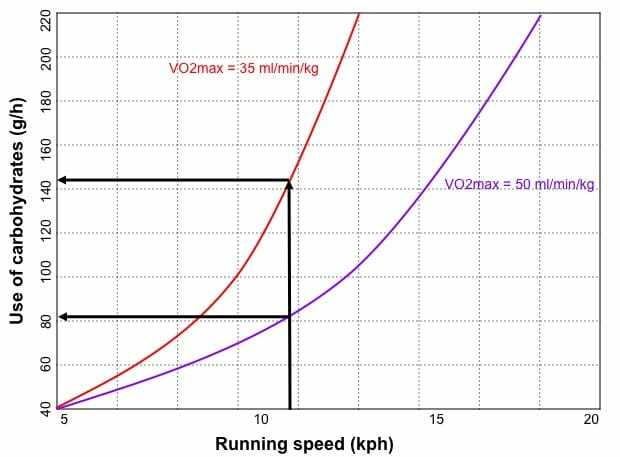 There is a basic relation between the energetic cost of running at certain exercise intensities (1). The higher the exercise intensity, the higher the percentage of carbohydrate metabolism on total energy production (see graphic above). With our performance diagnostics, we are able to measure this so-called metabolic cost of running during certain exercise intensities (see graphic underneath). Thus, we make it very predictable which running speed you will be able to hold for a given amount of time. This calculation shows it clearly: 4:15h will be easy to manage. 3:50h will be on point (the stores won’t run out!). 3:30h is gonna be very though and the chance of hitting the wall very high (this also depends on the amount of carbohydrates that have been eaten during the run!). 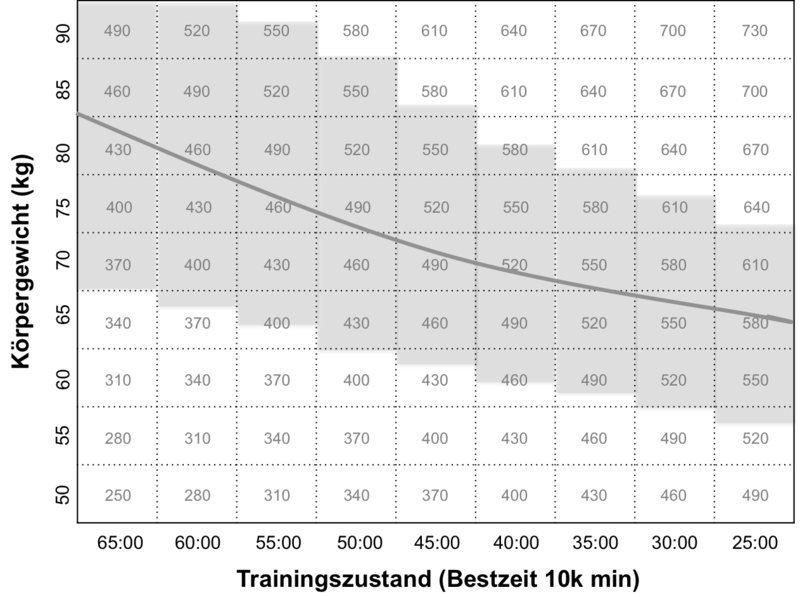 What we know so far; more fat means less carbohydrates. In order to metabolize fat, your body needs oxygen. This oxygen is inhaled via your lungs and transported through your circulating blood to your muscle cells. The main determining factor of fat metabolism is this amount of oxygen that can be consumed. The higher the volume of oxygen uptake in your muscle, the more fat you are able to metabolize (2). 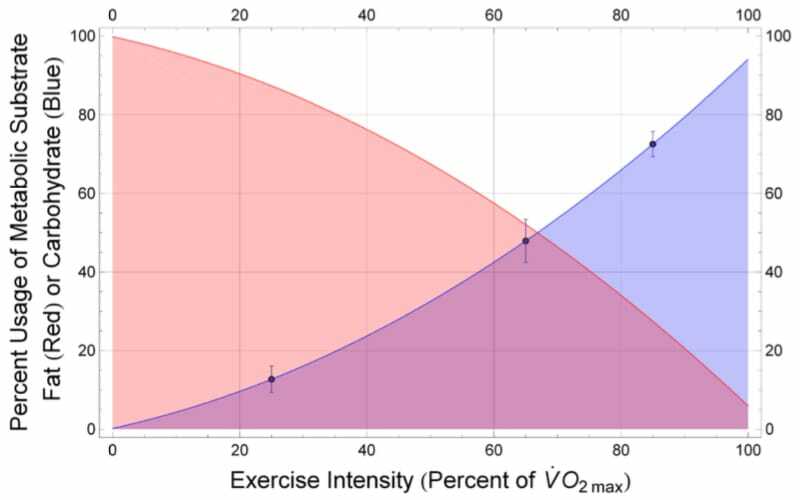 Within our performance diagnostics, we also measure your maximum volume of oxygen consumption (VO2max), a parameter that is strongly correlated to the amount of fat metabolism and carbohydrate usage (see graphic underneath).